I’ve had banana bread a few times and it has been horrible. I think people believe that if it tastes bad it might be good for you. Well, I came up with a recipe that may not be ‘good’ for you, but it tastes great and isn’t really ‘bad’ for you. I use less sugar than most and add a few flavor options that can make it your own. I usually don’t put nuts in my B-bread, just because people can be allergic. If you know your audience and everyone is good then feel free to nut it up to your hearts content. I personally will use crushed walnut but you are welcome to enjoy the nuts of your choosing. Preheat oven to 350 degrees, lube up a 4 by 8 loaf pan (butter or spray oil or coconut oil). In a large bowl mash up bananas with fork until pretty smooth, stir in melted butter. Add in baking soda and salt. Mix in sugar, egg, vanilla and almond extract. Pour batter into loaf pan, place in oven on cookie sheet. Bake 30 minutes, rotate 180 degrees and bake another 30 minutes. Remove from oven and let stand about 15 minutes before taking loaf out of pan and placing on a cooling rack. A 1/2″ thick slice cut in half down the middle to make two servings. Great with a small scoop of vanilla ice cream, whipped cream or some fresh berries. 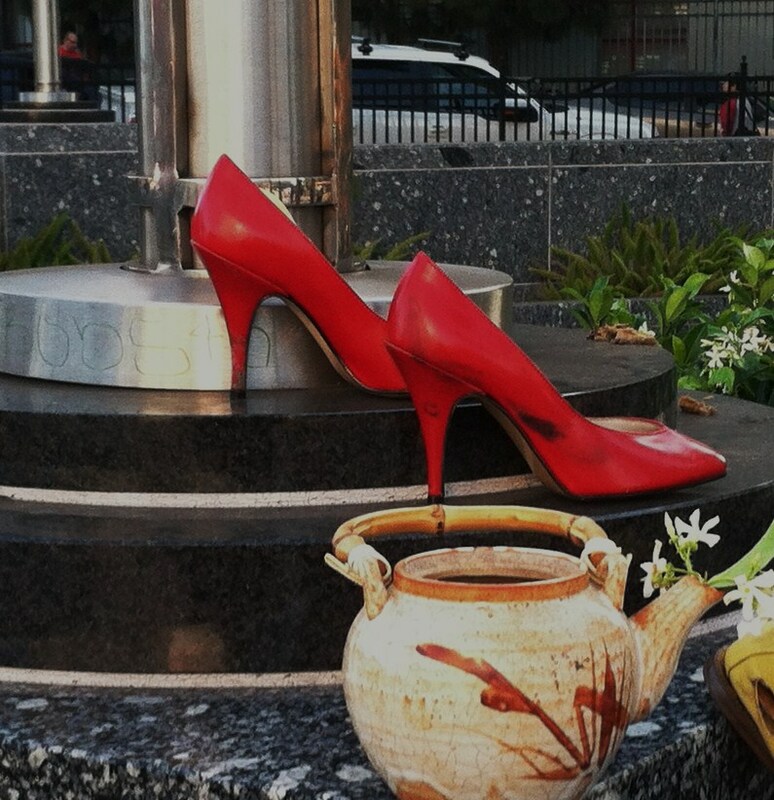 A small sprig of mint adds a nice touch. This is an easy recipe that will give you a great result and with some nice plating can make it seem like you are a master baker. 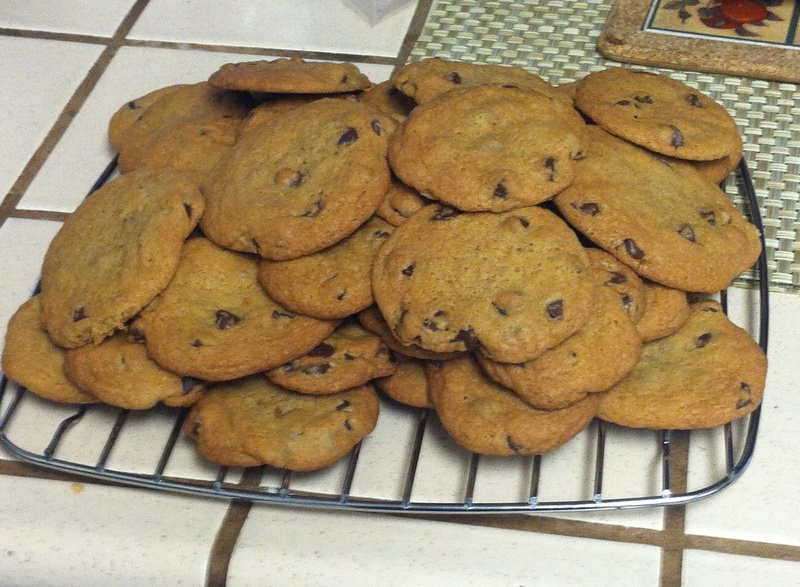 One of the most fun things you can do in the kitchen (besides THAT) is to bake. You take on your mad scientist persona and mix all this stuff together to create magic in the oven. Unlike stove top cooking, where you add things while you are making the food, the ingredients are mixed together before the cooking process begins. A mistake in measuring can result in a waste of time and money. Exciting! It is really easy to find great recipes online. I like recipe.com, they have a pretty good variety but there are several places to find recipes so have a search and let me know your favorite. One of the things you have to be aware of is the authors of the recipes are not always correct in measurements. 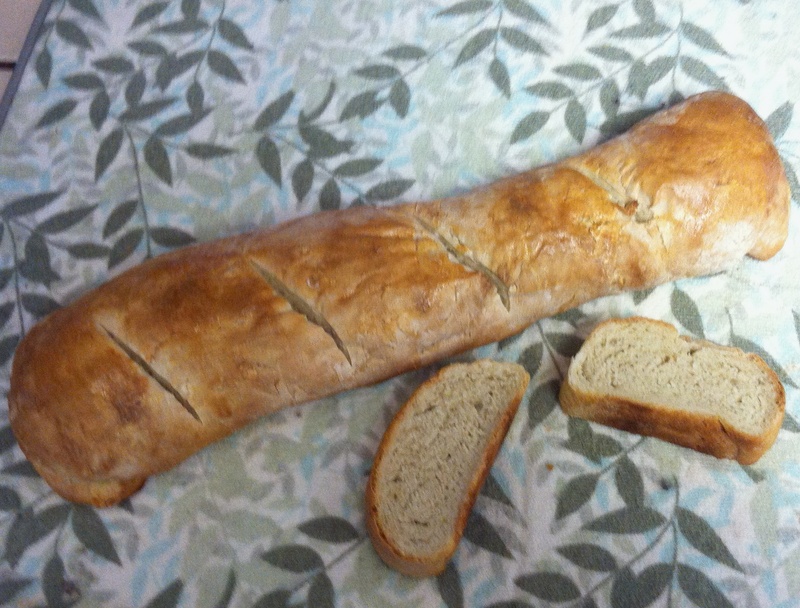 I used a bread recipe recently and there was too much flour, the loaf was way to heavy. I will add some of my baking experiences and methods in the next couple of days. In the meantime, let me know what sort of stuff you want me to make and I will have a go. 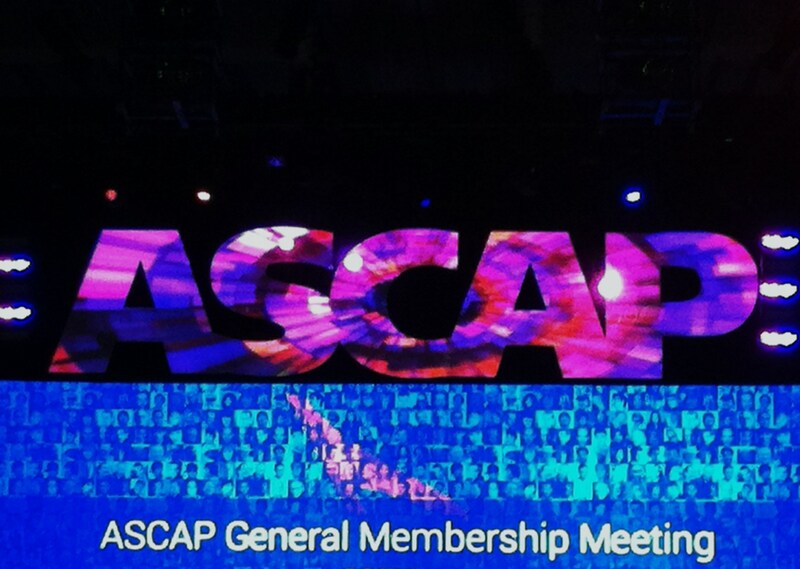 I finished up the ASCAP event this weekend. I have to admit I was pretty skeptical going in. I have attended other expos and conventions for different industries and they are usually just non-stop marketing. The ASCAP event was a little different though; yes, there was still a lot of marketing going on but there was a lot of really great educational events too. One of my favorites was by Ralph Murphy, a song writer and producer from Nashville. His presentation was full of humor and useful information. I got a chance to chat with him briefly and he was a real, down to earth fellow. I am looking forward to meeting and chatting with him again. Overall the event was pretty positive. I did get a little claustrophobia in the hallways though. The sponsors had tables in the halls so things were a bit crowded for my taste. I think if they put the booths in a exhibit space it would be more comfortable. I have to talk to industry people as part of my job and it was hard to have a conversation with all the noise and jostling about. The bottom line question is would I go back next year. I think I would, there was enough good information that it was worth the price of admission. So here we are, day two in beatafull downtown LA. Hollywood actually but whos counting. I got a ‘Tap’ card, which is the LA version of a Fast Pass, seven days for $2, less than parking and gas would cost to drive to the ASCAP event every day. The bus stop was only about a block from the hotel so no big deal. I said ‘good morning’ to the driver as I got aboard the bus, it took him by suprise so I guess being polite hasn’t reached southern California yet… The bus ride was only about 5 blocks, then I transferred to the Metro line, the Los Angeles subway/train system. The train was a little behind schedule but no big deal. The ride to the venue was only about 10 minutes. I like using public transit, you meet really odd people and you don’t have to look for parking. The ASCAP Expo is being held at the Loews Hollywood Hotel, right in the heart of tourista-ville. Michael Jackson was there, one of the Harlem Globetrotters, several Batmen (all in various levels of decay) and a Spider Man who looked like his web had snapped. Ah, the magic of the movies!! There were tons of events to go to, and it was hard to figure out what to do first. I ended up going to the opening speech, given by Paul Williams. Williams wrote ‘We’ve Only Just Begun’ and other top hit songs. His presentation was great and was a promising start to the expo. I then went on to forum of song writers titled ‘Anatomy of a hit song’ there was lots of interesting information, but the main take-a-way was to be true to your point of view and use a web site to find rhymes. The next one was a sales pitch by one of the sponsors, selling their web design service. Even the sales presentation was a little useful so that was cool. The afternoon was more great events and chatting with other attendees. I would have stayed for the afternoon social events but my back was feeling shreded ( I have spondylothesis) so I went back to the hotel to lay down. Trim away any excess fat from the chicken, check for bones…mix the ginger, I usually use about 3 tablespoons for 8 or 9 pieces of chicken. Garlic, one clove per every two pieces of meat, a tablespoon or two of pepper, depending on spice level desired. Use 1/8 cup of brown sugar. Add about 1 cup of soy sauce and 1/4 cup white wine. Mix everything with a whisk or fork, put in chicken. Let the chicken marinate for an hour or so. The chicken should be out of the fridge for a bit before going on the grill. I find that super cold meats just seem to toughen up when they are exposed to high temps right away. 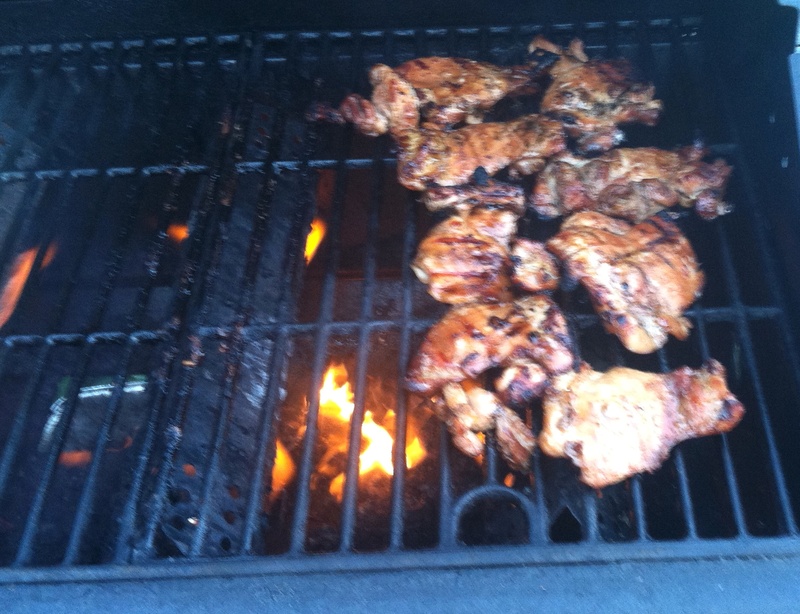 Heat your grill up, make sure it is reasonably clean…lay the chicken on the grill, close it and walk away. No need to constantly flip your bird! After about 3 to 5 minutes, turn the meat over and cover again. The sugar and soy sauce will give the meat a lovely dark complexion. In another 5 minutes you can remove your meat from the fire. Let it stand about 4 or 5 minutes before serving, it will be better this way. I like to serve this with steamed rice and a fresh green salad with a miso dressing.